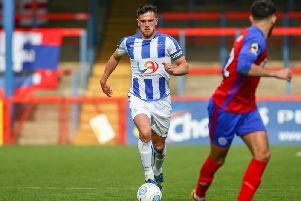 Blair Adams insists the Hartlepool United players are NOT feeling the pressure, as the club battles to keep themselves in the National League. But he says the importance of getting results sooner rather than later is not lost on those in the Pools dressing-room. Craig Harrison paid for a poor run of results, which saw Pools win just once in 13 games stretching back to November, losing his job despite the club’s dire financial state. And heading into the Ebbsfleet United clash at Victoria Park tomorrow, the pressure is back on Pools, under the guidance of caretaker Matthew Bates, as the gap between themselves and those in the bottom four has been closed to just three points. “Yeah, the pressure is on, but that is why we are footballers,” said Adams. “We have picked up a good result at the weekend then haven’t built on it against a side close to us in the league. “It was a grind of a game and we had nothing to show for it. We can’t let that happen on Saturday. “I wouldn’t say we are feeling the pressure as a team. “We are a big club for this league. Former boss Harrison repeatedly talked about confidence being the main issue at Pools as they slid from the edges of the play-off race to a relegation fight in the space of three barren months. That’s something Adams concurs with. “Our heads have dropped,” the defender said of recent performances. “We have to be better than that. We are professional footballers. There are 13/14 games left and we still have time to turn this around. “But the thing is it is no good one of us standing in front of the cameras and the tapes saying the same old things. Results have been remarkably hard to come by this year. Another shocker of a return came on Tuesday night - a damp squib of a performance resulting in a 2-0 loss to fellow relegation-threatened fifth tier strugglers Halifax Town. Reflecting on the encounter at the Shay, Adams said: “It was just another disappointing result. “I thought we matched them but it was a scrappy game and then they had that bit of luck for the first goal. The second goal was all too familiar - it was just not good enough. “You come across games like that probably 10 times a season. You are not playing well, the opposition are struggling, too. “Both teams cancel each other out.